What is Methocarbamol? What is methocarbamol used for? Methocarbamol is a prescription drug that is used as a muscle relaxant with or without physical therapy and as an adjunct to rest therapy for muscle pain and stiffness treatment. Chemically it is guaifenesin carbamate derivative with depressive properties on Central nervous system. Methocarbamol is available in the form of oral tablet in doses of 500 mg and 750 mg and injectable solution in the dose of 100 mg/ml. Methocarbamol is a skeletal muscles relaxant with central effects, used to treat muscle spasms. Structurally it is related to guaifenesin. Methocarbamol’s exact mechanism of action that causes skeletal muscle relaxation is still unknown. It is thought that this is caused by its depressant effects on CNS. Methocarbamol has no direct relaxant effects on nerve fibers, striated muscle, or the motor endplate. It will not directly relax contracted skeletal muscles. The drug has a secondary sedative effect. These side effects usually go after a few days or a couple of weeks. If they become more severe or don’t go away, patients should talk with their doctor or pharmacist. If some of these side effects occur, patients should immediately call their doctor. What are usual methocarbamol doses for muscle spasms? Maintenance dose: 4000 to 4500 mg per day in divided doses. Who should avoid methocarbamol use? Patients with liver disease: Methocarbamol is metabolized in the body by the liver. If someone has liver disease, this drug may build up in the body and cause side effects. In that case, doctor may initiate therapy on a lower dose or put you on a different schedule. 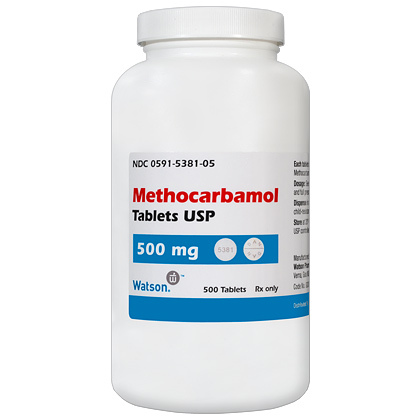 Patients allergic to methocarbamol: Methocarbamol may cause severe allergic reactions, symptoms may include: rash, hives, swelling of the face, tongue and lips and trouble with breathing. Pregnant women: Methocarbamol is listed in a FDA pregnancy category C list of drugs. That means that: Research in animals has been shown adverse effects to the fetus and that there are no relevant and conducted studies done in humans to be certain how the drug will affect the fetus. Women should talk with their doctor if they are pregnant or planning to become pregnant. This drug can be used only if the potential benefit overcomes the potential risk to the fetus. Mothers who are breast-feeding: Methocarbamol may pass into breast milk and may cause side effects to the infants. Mothers should talk with their doctors if they are breast-feeding a baby. Doctor may need to decide whether it is better to stop breast-feeding or stop taking methocarbamol. Elderly: The kidneys in elderly may have a lower function and may cause your body to excrete drugs more slowly. This may result that more of a drug will stay in the body for a longer time that increases the risk of side effects to happen. In this situation doctor may start your initial therapy on a lower dose. This can help keeping adequate levels of drug in the body. Children: Methocarbamol should not be used in children younger than 16 years. Methocarbamol + pyridostigmine bromide: Methocarbamol can reduce the levels of pyridostigmine bromide in blood. This could lower the efficacy of pyridostigmine bromide. Following drugs can increase drowsiness and sedation if they are used together with methocarbamol: anxiolytic drugs such as: alprazolam, lorazepam, clonazepam, bromazepam and diazepam, antidepressants such as: doxepin, amitriptyline and imipramine, painkillers such as: oxycodone, hydrocodone, tramadol, or morphine, antipsychotics such as: haloperidol, quetiapine and chlorpromazine. Methocarbamol + buprenorphine: Using buprenorphine together with methocarbamol can lead to very serious side effects such as respiratory distress, coma, or even death. Patients may need a dose adjustment and frequent monitoring by their doctor to safely use both medications. Methocarbamol + herbal products such as valeriana and kava kava. Patients should avoid taking methocarbamol with these herbal products as they can interact and add CNS side effects such as drowsiness and sedation. Can I take methocarbamol with alcohol? Alcohol can increase CNS side effects of methocarbamol such as drowsiness, dizziness and difficulty concentrating. Some patients could also experience impairment in judgment and thinking. Patients should avoid alcohol while there on a methocarbamol therapy. What If I miss methocarbamol dose? You should take the missed dose as soon as you remember. Skip the missed dose if it is almost time for your next scheduled dose. You should never take extra dose to make up the missed dose. What happens if I overdose methocarbamol? You should seek emergency medical attention or call the Poison Help line at 1-800-222-1222. Overdose symptoms may include severe drowsiness, fainting, seizure, loss of consciousness and low blood pressure. Can methocarbamol make me “High”? Is methocarbamol a recreational drug? There are many online reports and opinions that some people abuse methocarbamol for narcotic-like “high” effects because it can cause drowsiness and sedation. However, studies showed that methocarbamol has a very low narcotic effect, and that any of these narcotic-like effects with tmethocarbamol can only be achieved when it is taken at high doses from recommended and during a long term use which can lead to serious side effects. Can I give methocarbamol to my dog, cat or horse? Methocarbamol is FDA approved for administration as a muscle relaxant for dogs, cats, and horses. It is used for muscle spasms treatment caused by various diseases such as “animal slipped disk” – intervertebral disk disease, different traumas, or intoxication, for example permethrin poisoning in cats. As a veterinary medicine, methocarbamol is available as 500 mg tablets. Dosing for animals is based on their weight. To get Methocarbamol for your pet you need a prescription from your veterinarian.